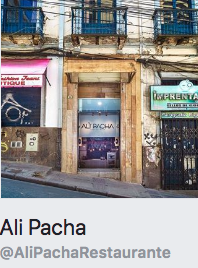 Ali Pacha’s superb Vegan Food, come to La Paz, Bolivia! Vegan in Bolivia has caught up very fast, specially among Millennia’s. One of my dearest daughters lives overseas and when she comes, finds it hard to find vegetarian places to eat, let alone vegan, when visiting Bolivia. I’m sure she and her hubby will find this place delicious! Kudos to Ali Pacha! The above is the opinion of Bolivian Thoughts. Spotted: Vegan Bar Food, Secret Menus, and New Openings We Found This Week! Last week we discovered tons of vegan food, from cheesy veggie pizza and vegan jazz bars to lentil burgers in New Jersey and super cool concepts. This week, we’ve Spotted even more! From vegan-friendly bar food to secret menus with five-course dinners and stunning plates of Asian-inspired cuisines, here are the coolest new vegan restaurants and menus we’ve seen. We do a spotted series every week, so don’t forgot to check out our Spotted Series Archives. 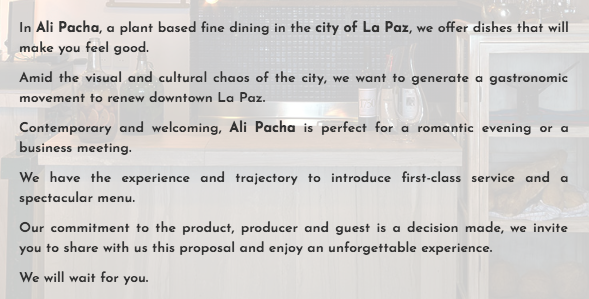 Ali Pacha, La Paz, Bolivia: Ali Pacha offers a unique dining experience in Bolivia, a place of scarce vegan options. Here, you’ll find a secret menu that boasts three, five or seven-course meals, where you never know what you’ll get. Find them at Calle Colón Nº 1306 Esq. Potosí, La Paz, Bolivia. Email us at team@onegreenplanet.org if you spot any new vegan restaurants near you and we’ll feature it in our ongoing ‘Spotted’ series! If you enjoy food that is served in vegan restaurants like these, we highly recommend downloading the Food Monster App, it’s available for both Android and iPhone and has free and paid versions. The app is loaded with thousands of allergy-friendly & vegan recipes/cooking tips, has hundreds of search filters and features like bookmarking, meal plans and more!